RIM has revolutionized the way American businesses operate by introducing advanced wireless communications to the corporate masses. Through its now ubiquitous BlackBerry devices, executives, lawyers, and politicians stopped calling and started texting. 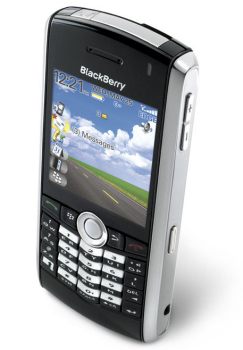 Now, in its continuing expansion into the consumer market, RIM and T-Mobile just released the BlackBerry Pearl 8100 ($199.99 – T-Mobile Only). The new lightweight T-Mobile BlackBerry Pearl is a quadband GSM/GPRS/EDGE world phone with all the benefits of a professional BlackBerry plus the features and technology we would want in our phones. For example, this is the first BlackBerry to include a camera (1.3 megapixel) and a media player with a microSD slot for media storage. Internet messaging and data functionality includes support for up to 10 different email accounts, instant and text messaging (AOL/AIM, Yahoo!, MSN, and ICQ), and a web browser. For easy communication, the BlackBerry Pearl comes with Bluetooth 2.0 and a speakerphone. At $199.99, it’s also a good deal for an advance phone.